The first time we had truffles were from our sister in law, Jen, about 10 years ago. 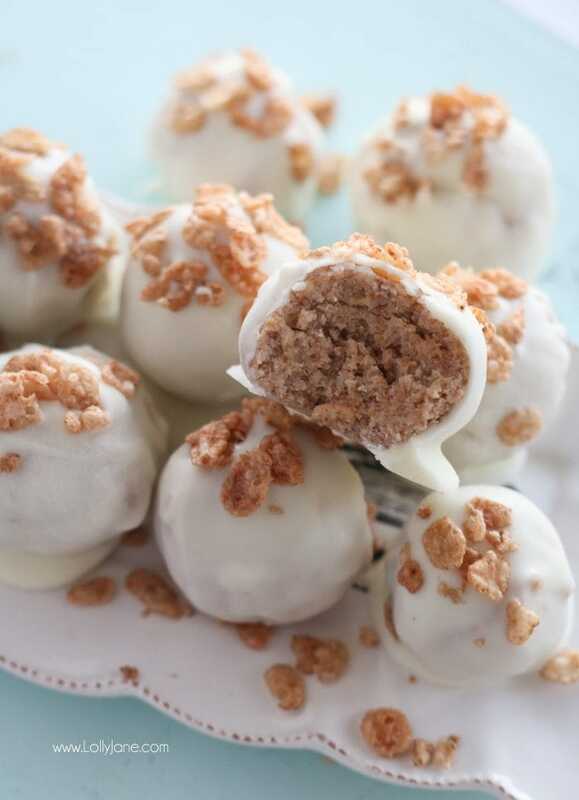 Every year for Christmas she made the most decadent Oreo filled truffles with creamy white chocolate, topped with Oreo crumbs. 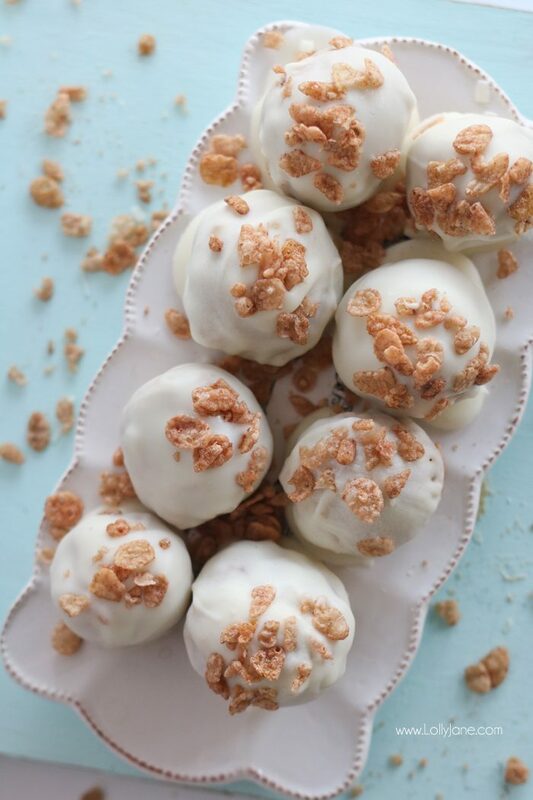 Truffles soon started popping up on Pinterest and they’re one of our favorite desserts to make today. Why? Because they’re so easy yet super fast which is a big win in our busy book! 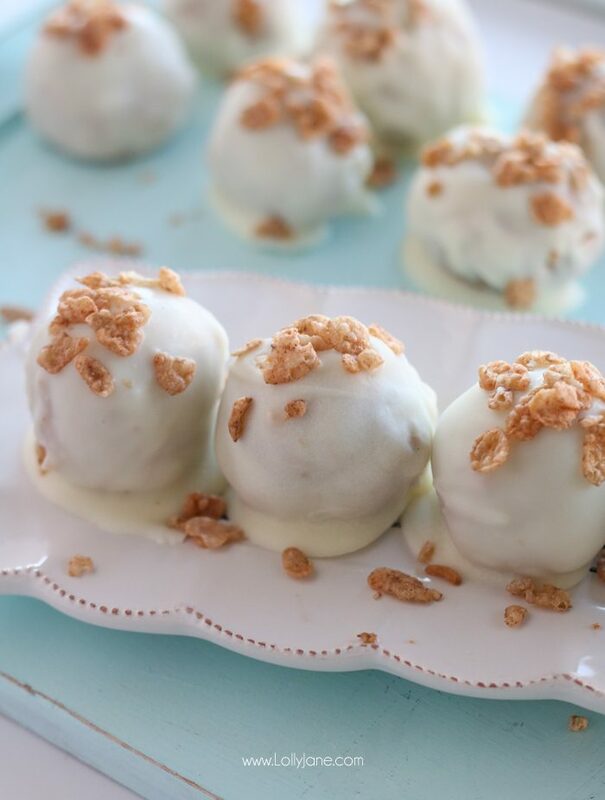 These easy White Chocolate Cinnamon Truffles are so yummy too! You can make them in less than 20 minutes. They taste just like a snickerdoodle with the Cinnamon Pebbles cereal mixed in. Mmm! Gather your ingredients, you probably have all of them hiding in your pantry and fridge. 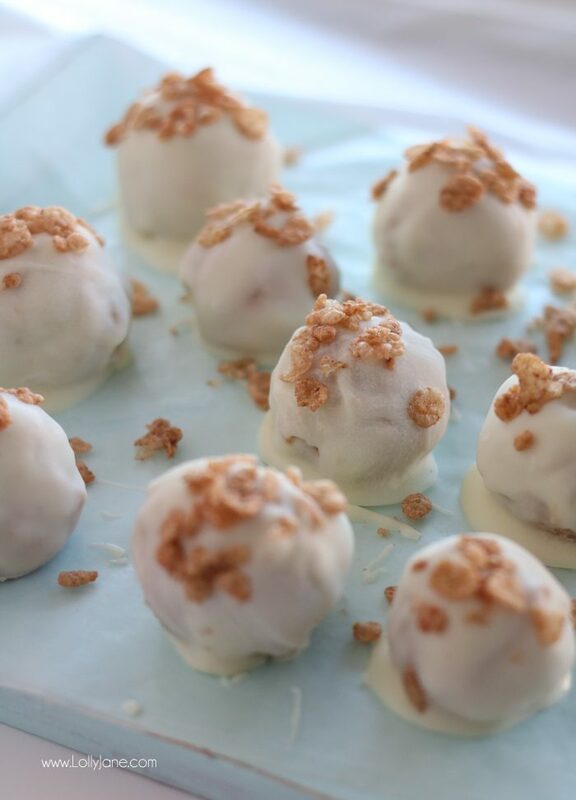 Easy White Chocolate Cinnamon Truffles, so yummy! Make in less than 20 minutes, tastes like a snickerdoodle with the Cinnamon Pebbles cereal mixed in. Mmm! 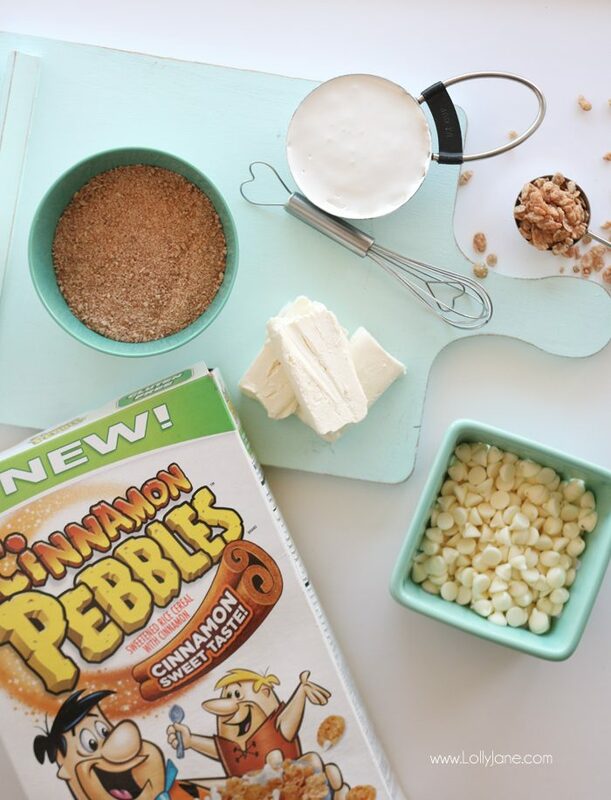 Crush Cinnamon Pebbles in food processor or in a bag with a rolling pin. Mix crushed cereal with room temperature cream cheese and marshmallow fluff. Dip into melted chocolate and immediate sprinkle Cinnamon Pebbles on top for garnish. Chill in freezer for 25 minutes or until chocolate is firm. That’s all there is to it. Very simple and super yummy. 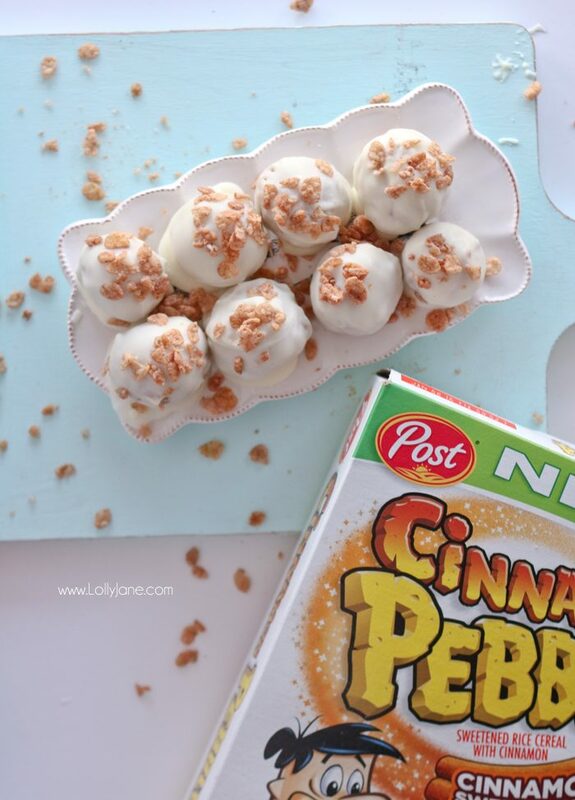 Visit more of our ideas using Post cereal to create yummy treats and fun crafts too! 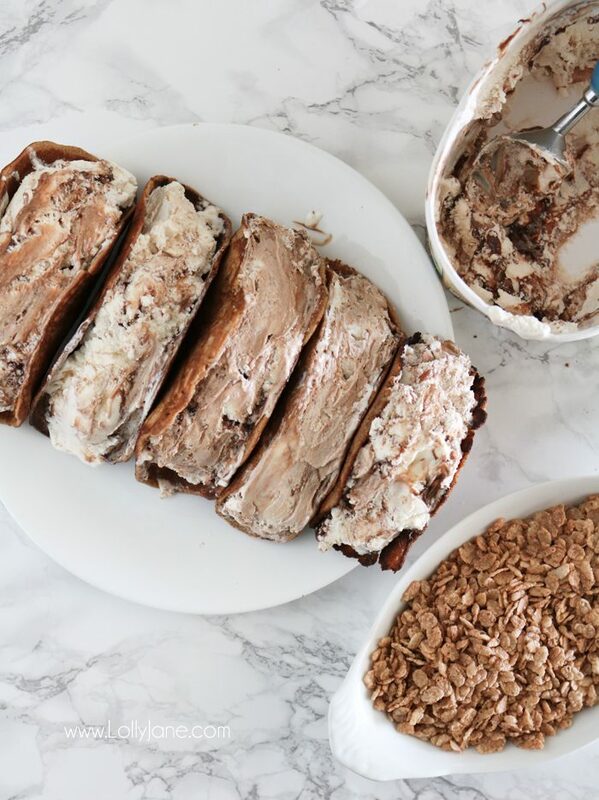 Our Cinnamon Choco Tacos are blast from the past, remember the ones from Taco Bell in the 90’s? Mmm! 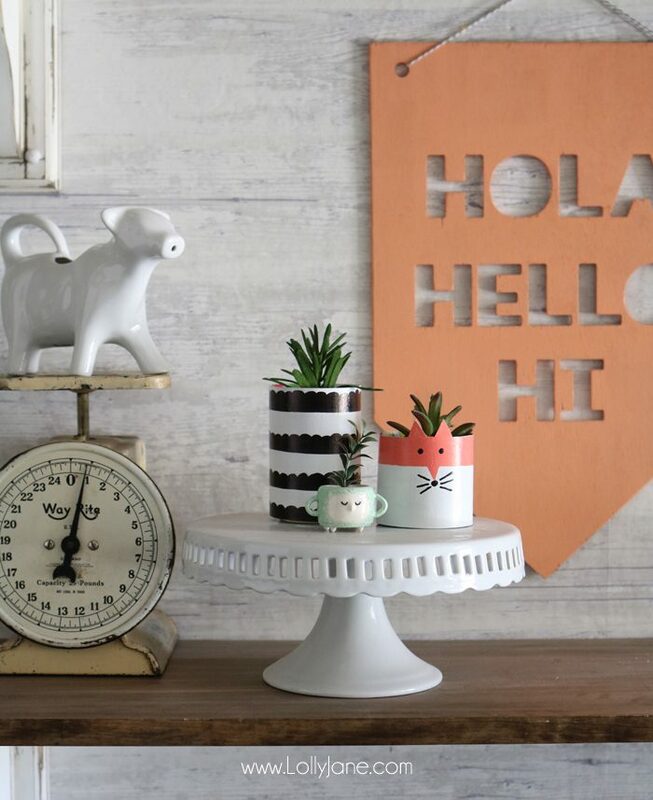 We upcycled a Cinnamon Pebbles box to create a trendy succulent planter. 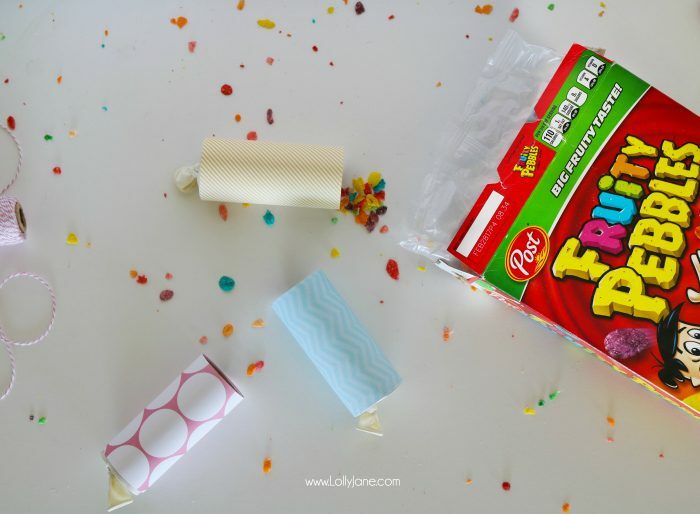 Instead of rice, fill our diy toilet paper roll popper with Fruity Pebbles for some colorful fun! Previous Post: « I chalk painted my countertops! 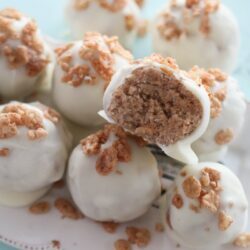 hey girls- these truffles look so yummy! Yikes, these look REALLY good! 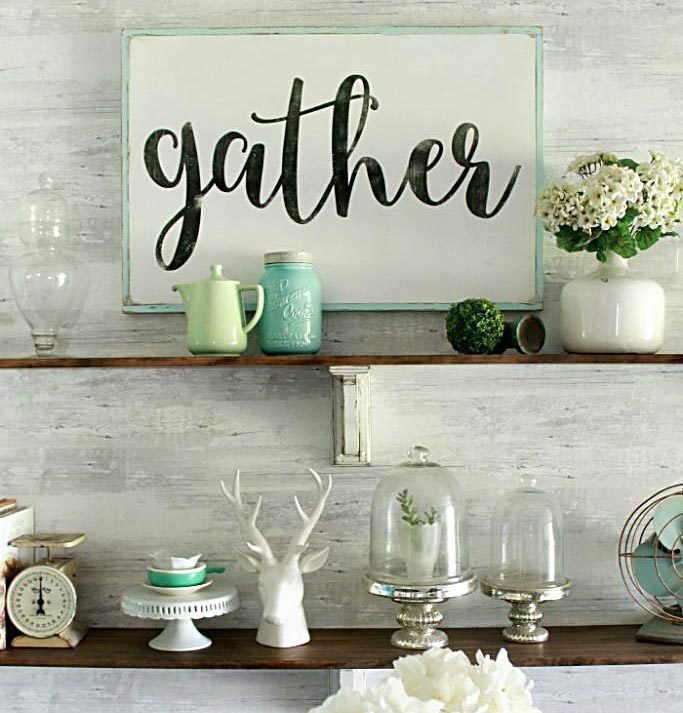 Thank you for sharing with us on the Art of Home-Making Mondays at Strangers & Pilgrims on Earth! You’ve convinced me that I need these! 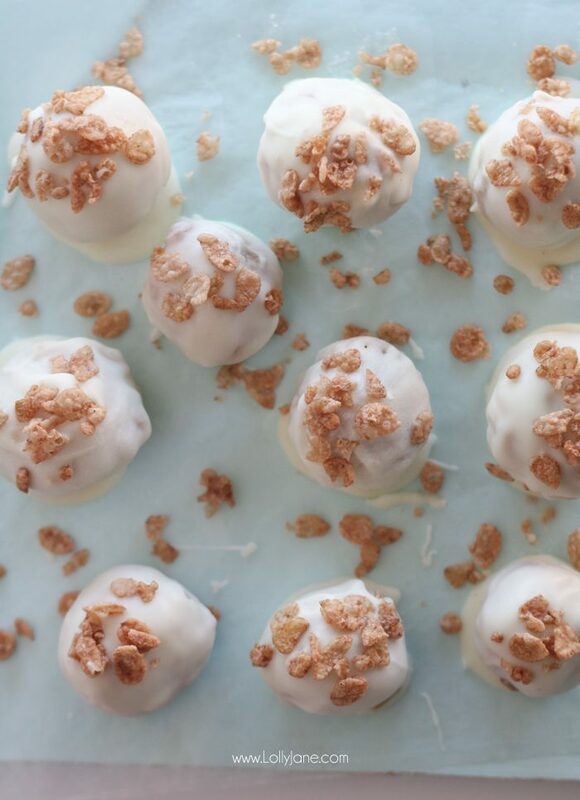 These truffles are too tempting. What is marshmellow fluff? Is marshmallow melted ? I will take a 1 lb. box to go for my Mother’s Day gift please! 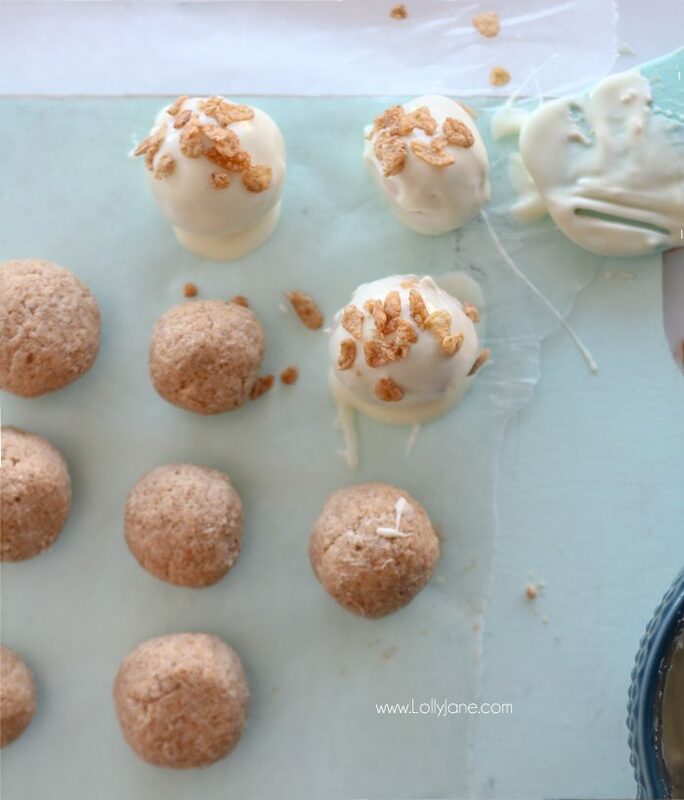 Your White Chocolate Cinnamon Truffles will be a very special treat! Hope you are having a great day and thanks so much for sharing with Full Plate Thursday! This looks like a recipe I need to try when my granddaughter is visiting this summer. I bet she’d love to make them! 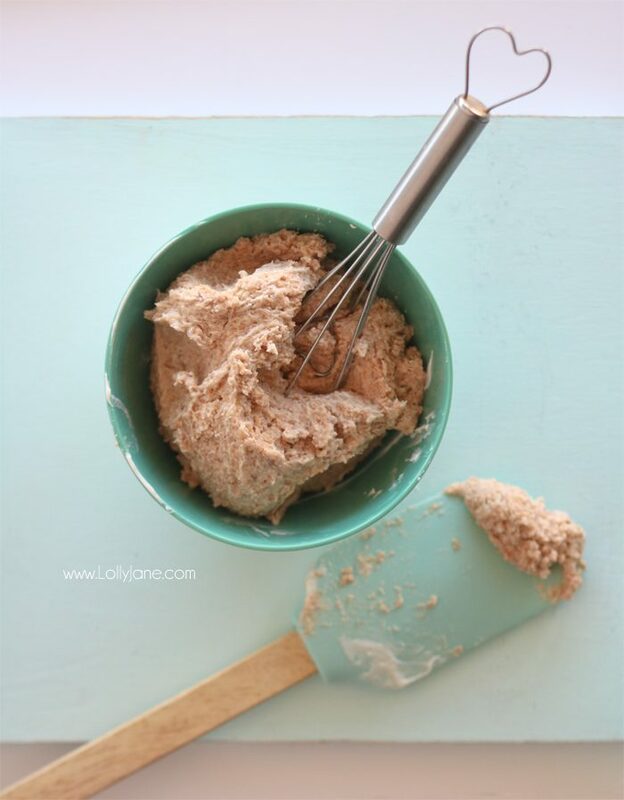 Thanks for sharing your recipe at the Family Joy Blog Link Party this week. 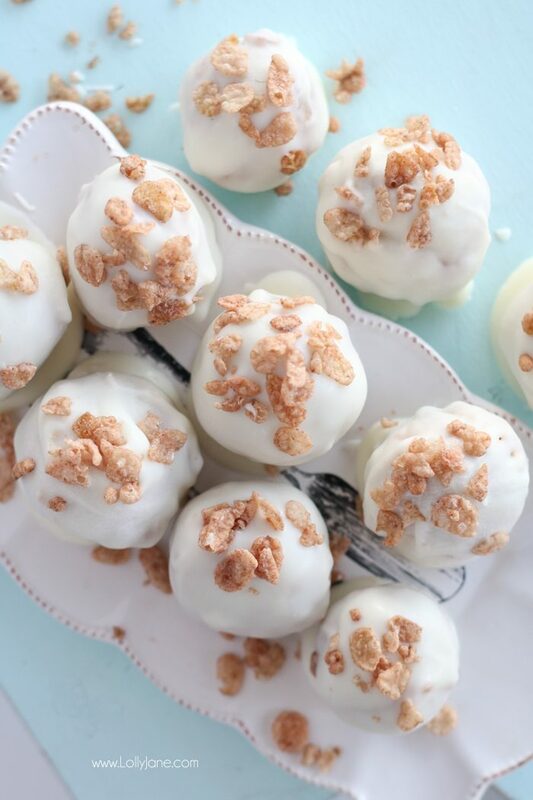 Oh these look decadent and although not a huge white chocolate fan I’m going to give them a try. Thanks for linking up at #overthemoon, I’ve pinned and shared. Yum!!!! And cinnamon is a great anti-inflammatory – so eat to your health!! Thanks for sharing on the What’s for Dinner link up! These truffles are all I needed to calm my kids’ spirits that are quite upset due to having to stay home with the flu, I’ll make the recipe to cheer them up.